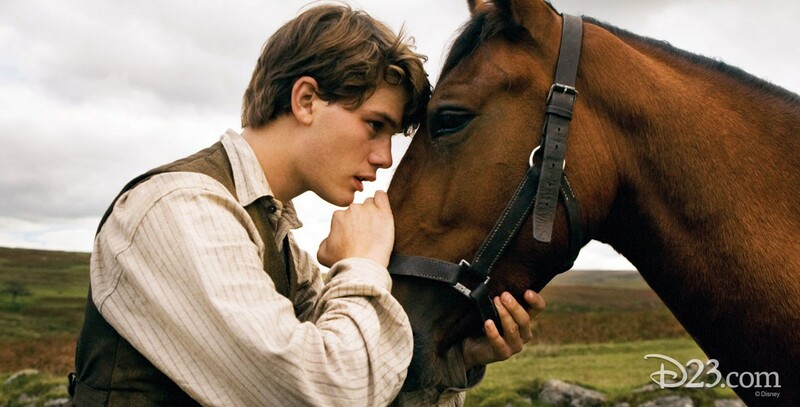 War Horse (film) In rural England, a remarkable friendship occurs between a horse named Joey and a young man called Albert, who tames and trains him. They are forcefully parted when Joey is sold to the cavalry and sent to the trenches during World War I, changing and inspiring the lives of all those he meets—British cavalry, German soldiers, and a French farmer and his granddaughter. Back in England, Albert cannot forget Joey, and, even though he is not old enough to enlist in the army, he embarks on a dangerous mission to find his horse and bring him home. A DreamWorks film, released by Touchstone on December 25, 2011. Directed by Steven Spielberg. 146 min. Stars Jeremy Irvine (Albert Narracott), Emily Watson (Rose Narracott), Peter Mullan (Ted Narracott), David Thewlis (Lyons), Benedict Cumberbatch (Major Stewart), Toby Kebbell (Geordie), Tom Hiddleston (Capt. Nichols). Based on a 1982 children’s novel by Michael Morpurgo and a 2007 stage adaptation. Filmed in CinemaScope.